The architect Antoni Gaudí created some pretty fantastical and unusual buildings in Barcelona and across northern Spain, but there have been many people both before and after him who have also designed and constructed bizarre, unusual structures across the country. Here are some of our favourites. 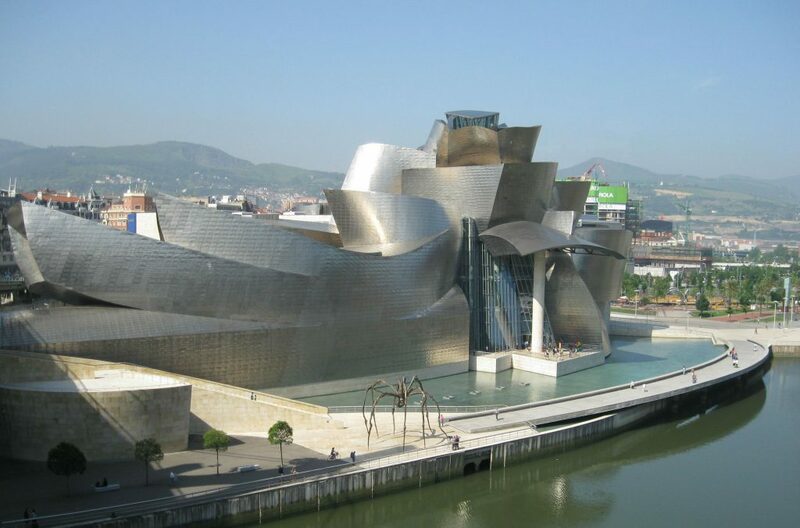 The Guggenheim, Bilbao’s famous art museum, is a vast metal building created from pieces of curvy titanium and was designed by American-Canadian architect Frank Gehry. The building was completed in 1997 and the museum celebrated its 20th anniversary this year. Shimmering and reflecting in the sun, it somewhat resembles a huge ship sailing down the Nervión River. 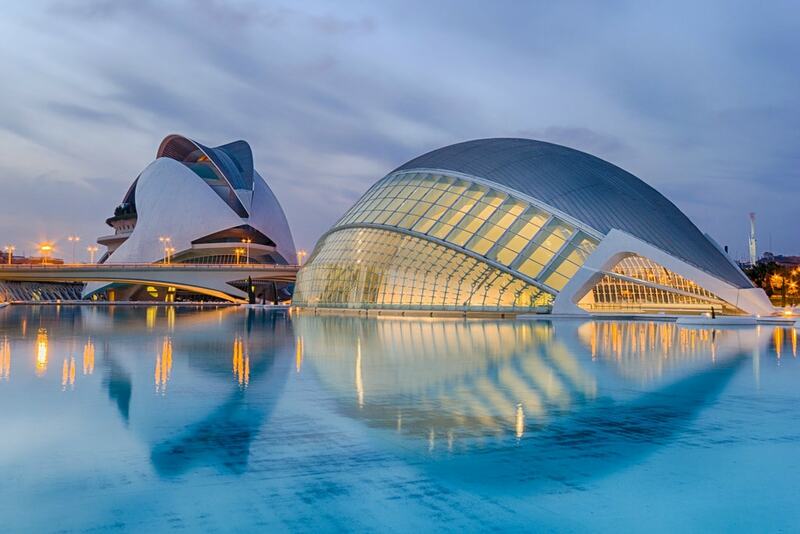 Valencia’s City of Arts and Sciences is a whole city of futuristic, unusual-looking buildings which include the Oceanogràfic (Europe’s largest aquarium), the Hemisfèric 3D cinema, the Príncipe Felipe Science Museum and the Palau de les Arts Reina Sofía opera house. Designed by Santiago Calatrava and Félix Candela, the first building in the complex was inaugurated in 1998 and the last was opened in 2005. Today, the city has become an important symbol of Valencia. Another Frank Gehry construction is the Hotel Marqués de Riscal, located inside The City of Wine complex of Elciego and part of the Marqués de Riscal winery in Rioja. 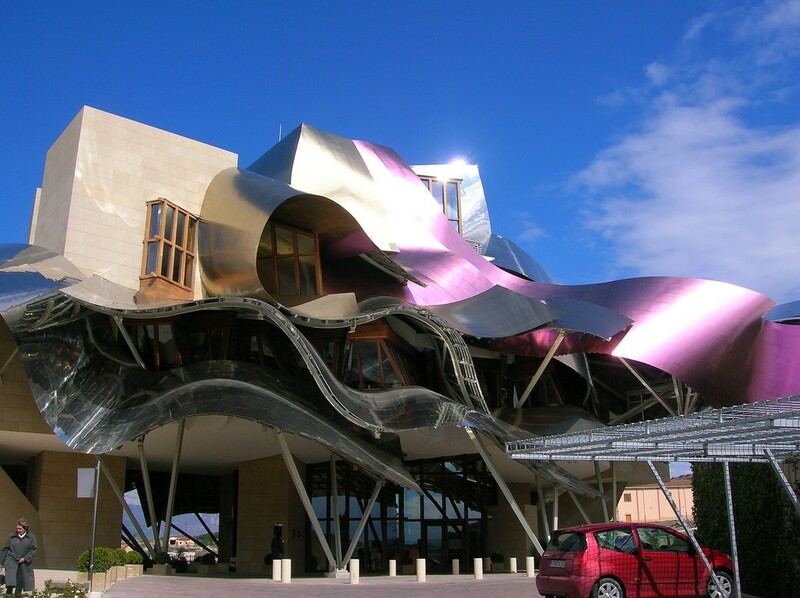 Its undulating titanium ribbon-like structure is an unmistakable style of Gehry’s, who created it to mimic the shiny foil around a wine bottle and the deep purple of the grapes. 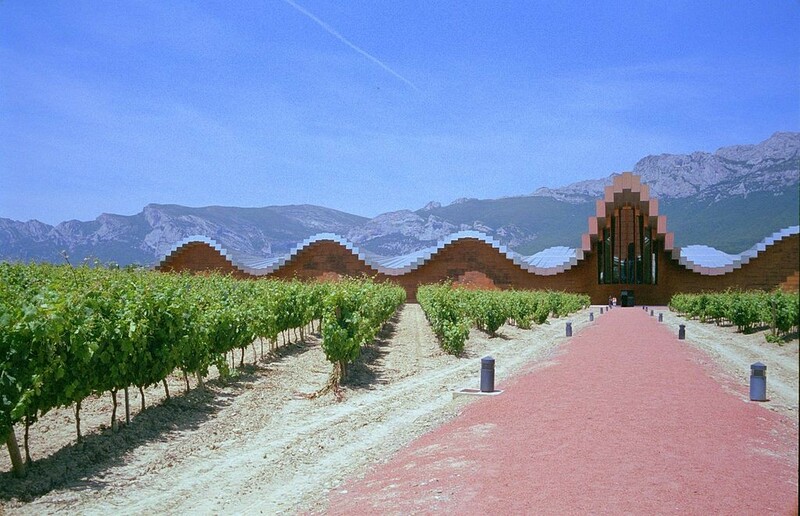 Like the Marqués de Riscal, Bodegas Ysios is another unique winery located in La Rioja. This, like the City of Arts and Sciences in Valencia, is also a creation by Santiago Calatrava built as a symbol of La Rioja wine country. Its is also said to mirror the undulation of the Cantabrian mountain range behind it. 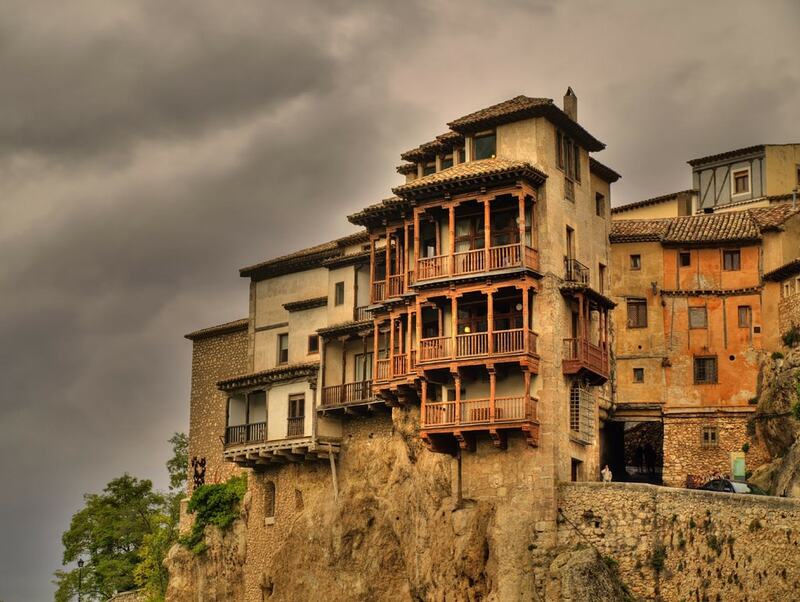 The Hanging Houses of Cuenca, also known as the Casas Colgadas in Spanish, can be found in the historic walled town of Cuenca, now declared a UNESCO World Heritage Site. These unique buildings cling to the edge of the Huécar Gorge and overlook its dramatic precipice. At one time, the whole gorge was covered in these hanging houses but today only three remain. Fully renovated at the beginning of the 20th century, they are built in a traditional Gothic style with intricate wooden balconies and Renaissance-style entranceways. 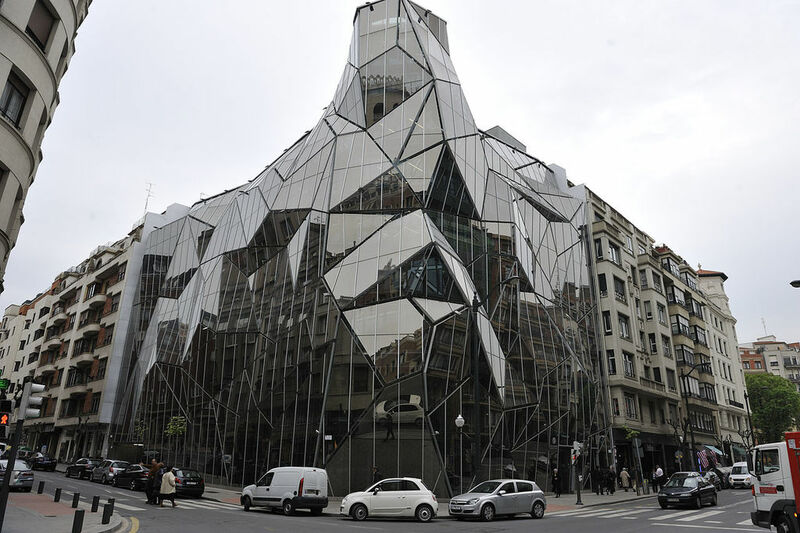 This amazing glass and steel building is located in the Basque city of Bilbao and was designed by architect Juan Coll-Barreu. The building looks akin to origami created from glass and is used as the headquarters for the city’s health department. 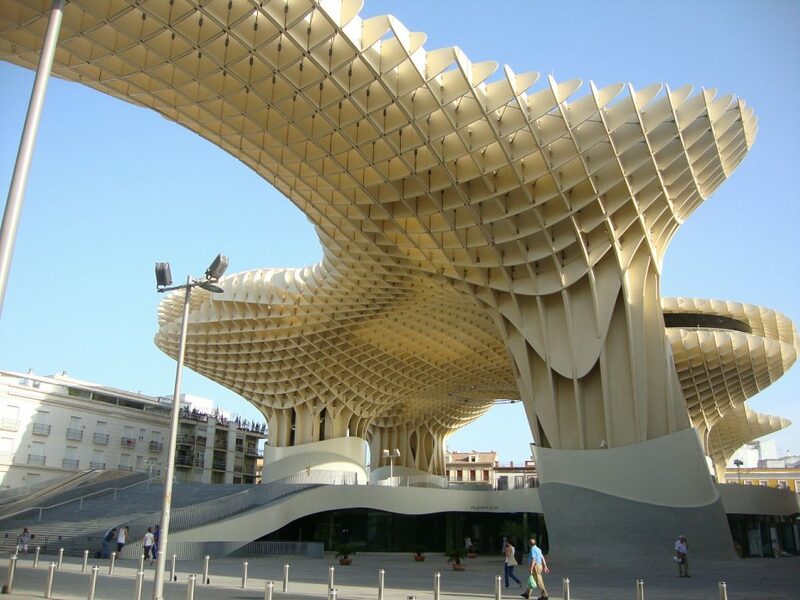 Located in the Andalusian city of Seville, the Metropol Parasol is a huge wooden structure designed by German architect Jürgen Mayer. It was inspired by the vaults of the Cathedral of Seville and the ficus trees in the nearby Plaza de Cristo de Burgos and is said to be the largest wooden structure in the world. Nicknamed Las Setas, or ‘the mushrooms’ by the locals, it features an underground atrium full of Roman and Moorish ruins, a large plaza, a central market and a restaurant. In the small town of Guadix in the province of Granada, you’ll find some of the most unique homes in the whole of Spain—cave houses. Cut out of the earth, there are around 2000 underground cave homes here with small chimneys that stick out of the ground. They were built by the Moors around the late 1500s who were fleeing the city of Granada when the Catholic monarchs tried to regain control. Barcelona’s Hotel Porta Fira is located on the edge of the city close to the airport. 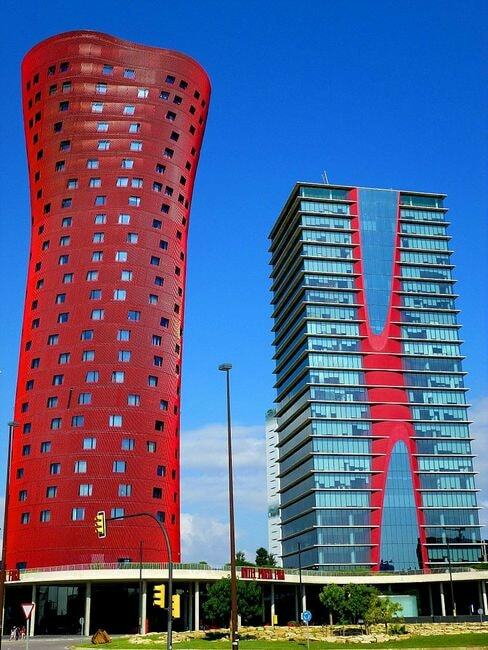 Designed by Toyo Ito and completed in 2010, it looks like a huge wavy red skyscraper and was the winner of the Emporis Skyscraper Award in 2010. Built for the Expo of Zaragoza in 2008, the Pabellón de Aragón was designed by Daniel Olano to look like a wicker basket and to mimic the mountainous landscapes of the region of Aragón. Today it is not used for any particular purpose but kids use the area underneath the structure as a skate park. The artist Salvador Dalí is probably more known for fine art than for designing buildings, but he was instrumental in creating a few. 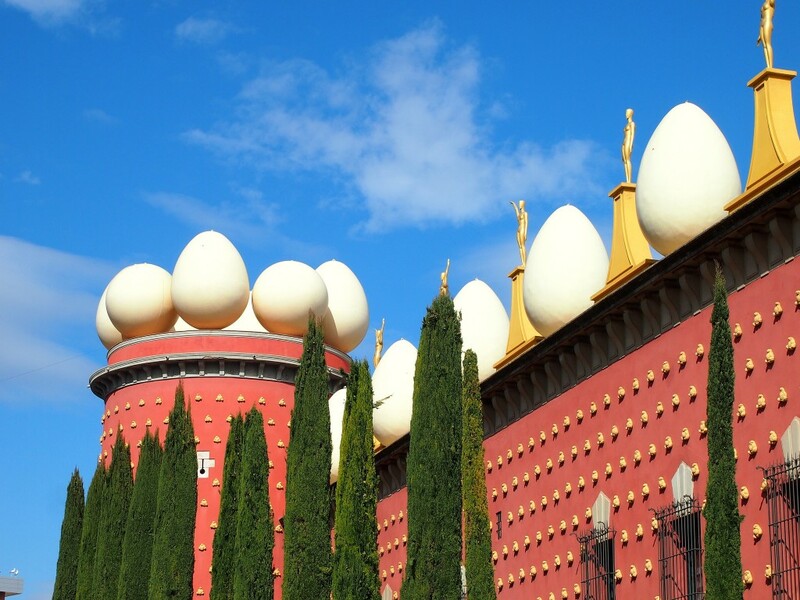 What was once known as the old Municipal Theatre of Figueres was redesigned by Dalí to feature yellow, plastic, croissant-like structures covering the walls and white eggs with gold figurines lining its rooftop. Built to house the artist’s work, it is now the best Salvador Dalí museum in the world and is filled with his quirky, surrealist work.